The alphabetical list below contains the names of special interest groups -- "think tanks" and other non-profit organizations -- that are known to be, or to have been, American Legislative Exchange Council (ALEC) members or supporters. Find corporate trade groups here. The corporations known to be currently involved with ALEC, as of September 2013, appear in BOLD. AARP, Inc. (formerly American Association of Retired Persons), Trustee-Level sponsor of ALEC's 2016 annual meeting held July 27-29 in Indianapolis, Indiana; On August 5, 2016 an AARP representative stated that the organization would not renew its membership in ALEC. AARP had previously terminated its ALEC membership on April 16, 2013.Although no longer a member, AARP's Associate State Director for Advocacy Stephen Jennings was listed as a "ALEC Private Sector Non-Member" in a 2018 email. American Federation for Children, "Trustee" level sponsor of 2011 ALEC Annual Conference ($5,000 in 2010), "Director" level sponsor of the 2012 ALEC Annual Meeting and “Trustee” level sponsor of the 2013 ALEC Annual Conference ($5,000). Americans for Prosperity, Member of ALEC Energy, Environment and Agriculture Task Force, and “Trustee” level sponsor of the 2013 ALEC Annual Conference ($5,000). Americans for Tax Reform, Member and Exhibitor at ALEC's 2011 Annual Conference - Government Affairs Manager Kelly William Cob spoke on the "Exploring ALEC positions on E-commerce and E-taxes" panel at the 2011 ALEC Annual Meeting in New Orleans. Center for Competitive Politics (an SPN associate member, Public Safety and Elections Task Force Executive Committee member and Exhibitor at ALEC's 2011 Annual Conference, terminated membership on March 19, 2013 because, according to ALEC documents, "JPP [ALEC's new "Justice Policy Project," which was formed after its Public Safety and Elections Task Force was shut down in the wake of the death of Trayvon Martin and subsequent controversy over the "Stand Your Ground" law initially used by George Zimmerman to avoid arrest] no longer works on issue"
Charles Koch Institute, Private Sector Member registered for the 2017 Annual Meeting. Commonwealth Foundation (an SPN member), member of ALEC's Tax and Fiscal Policy Task Force and Energy, Environment and Agriculture Task Force, terminated membership on March 9, 2013 because, according to ALEC documents, "former SPN members - would like to join again if can fit in budget"
Doctor Patient Medical Association (DPMA), Member, ALEC Health and Human Services Task Force, terminated membership on April 22, 2013 because, according to ALEC documents, "unable to reach contact; history of being late on payments"
Energy Policy Network, Private Sector Member registered for the 2017 Annual Meeting. Foundation for Advancing Alcohol Responsibility, Private Sector Member registered for the 2017 Annual Meeting. Free State Foundation - Research Fellow Seth Cooper is former director of the ALEC Telecommunications and Information Technology Task Force and currently serves as Amicus Counsel for ALEC.Senior Fellows and Staff, organizational website, accessed September 2012</ref> spoke on the "Exploring ALEC positions on E-commerce and E-taxes" panel at the 2011 ALEC Annual Meeting in New Orleans. Goldwater Institute, ALEC Education Task Force, Tax and Fiscal Policy Task Force and International Relations Task Force member Goldwater's Naomi Lopez listed as a "ALEC Non-Profit Member" in 2018 email. Grand Canyon State Electric Cooperative Association, GCSECA's Casey Ratlief is listed as a "ALEC Non-Profit Member" in 2018 email. Heartland Institute, Exhibitor at ALEC's 2011 Annual Conference, Telecommunications and Information Technology Task Force member, Education Task Force member, Commerce, Insurance and Economic Development Task Force Financial Services Subcommittee member, Energy, Environment and Agriculture Task Force member and “Chairman” level sponsor of the 2012 ALEC Annual Meeting. Heritage Foundation, Exhibitor at ALEC's 2011 Annual Conference. Private Sector Member registered for the 2017 Annual Meeting. Illinois Policy Institute ALEC Tax and Fiscal Policy Task Force member, on the host committee for the 2013 ALEC Annual Conference, and “Vice Chairman” level sponsor of the 2013 ALEC Annual Conference ($25,000). Independence Institute, ALEC International Relations Task Force member, Tax and Fiscal Policy Task Force member. Private Sector Member registered for the 2017 Annual Meeting. James Madison Institute (an SPN member), member of ALEC's Education Task Force and Tax and Fiscal Policy Task Force, terminated membership on February 13, 2013 because, according to ALEC documents, "former SPN members - would like to join again if can fit in budget"
John Locke Foundation (SPN member), member of ALEC Energy, Environment and Agriculture Task Force Tax and Fiscal Policy Task Force, and Education Task Force; terminated membership on May 11, 2013 because, according to ALEC documents, "former SPN members - would like to join again if can fit in budget"
Kansas Policy Institute (KPI), member of ALEC's Tax and Fiscal Policy Task Force (represented by KPI president Dave Trabert). KPI is also a member of the State Policy Network (SPN), which also has [[#S|ALEC ties]. Lumina Foundation for Education ("private, independent foundation... committed to enrolling and graduating more students from college"), "Chairman" level sponsor of 2011 ALEC Annual Conference ($50,000 in 2010) and sponsor of the August 4th, 2011, Plenary Session speech of former West Virginia Governor Bob Wise of the Alliance for Excellent Education - A Lumina spokesperson told CMD in May 2012 that it is no longer a member. See Corporations Which Have Cut Ties to ALEC for more. Mercatus Center at George Mason University, Exhibitor at ALEC's 2011 Annual Conference. Private Sector Member registered for the 2017 Annual Meeting. National Center for Policy Analysis (an SPN associate member), member of ALEC's Energy, Environment and Agriculture Task Force and Health and Human Services Task Force, terminated ALEC membership on April 16, 2013 due to "budget cutbacks"
Oklahoma Council of Public Affairs, ALEC Education Task Force member, and “Trustee” level sponsor of the 2013 ALEC Annual Conference ($5,000). Opportunity Ohio, “Trustee” level sponsor of the 2013 ALEC Annual Conference ($5,000). 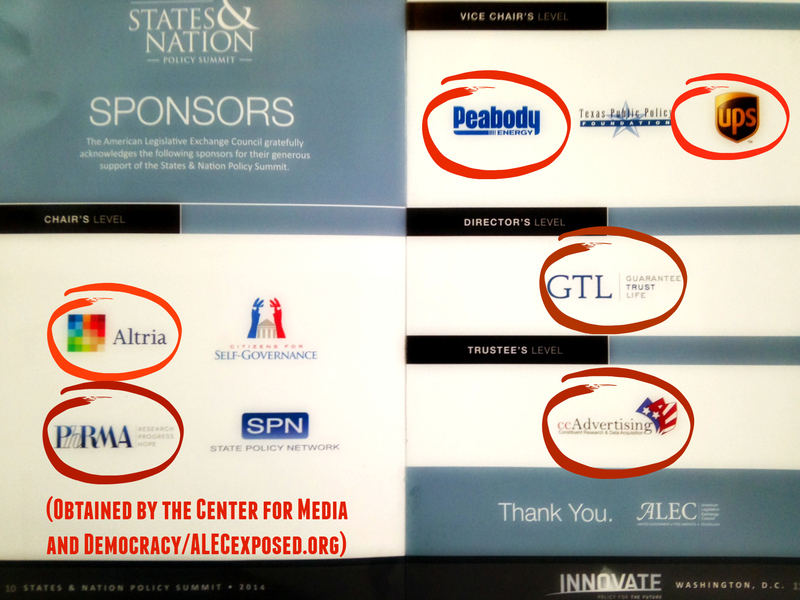 State Policy Network (SPN), "Chairman" level sponsor of and exhibitor at 2011 ALEC Annual Conference ($50,000 in 2010), sponsor of the 2012 States & Nation Policy Summit in Washington, DC, "President" level sponsor of the 2012 ALEC Annual Meeting, host committee for the 2013 ALEC Annual Conference, “Chairman” level sponsor of the 2013 ALEC Annual Conference ($50,000), and "Chairman" level sponsor of ALEC's 2014 States and Nation Policy Summit. Sutherland Institute (Utah think tank, member of ALEC-member State Policy Network), Member of ALEC Utah Host Committee for 2012 annual meeting, and “Chairman” level sponsor of the 2012 ALEC Annual Meeting. Texas Public Policy Foundation, “Chairman” level sponsor of the 2012 ALEC Annual Meeting and "Vice Chairman" level sponsor of ALEC's 2014 States and Nation Policy Summit. US Term Limits, Private Sector Member registered for the 2017 Annual Meeting. ↑ "Playbook," Politico, August 5, 2016. ↑ 3.00 3.01 3.02 3.03 3.04 3.05 3.06 3.07 3.08 3.09 3.10 3.11 3.12 American Legislative Exchange Council, ALEC 40th Anniversary Annual Meeting Board Meeting packet, organizational documents, August 6, 2013, released by The Guardian December 3, 2013. ↑ 4.0 4.1 4.2 Melissa Taylor, [Melissa Taylor email to Karen Fann On File at CMD], Arizona ALEC List, July 27, 2018. ↑ American Legislative Exchange Council, Education As of 7/1/2011, organizational task force membership roster, July 1, 2011, obtained and released by Common Cause, April 2012. ↑ Center for Media and Democracy, Buying Influence: How the American Legislative Exchange Council Uses Corporate-Funded 'Scholarships' to Send Lawmakers on Trips with Corporate Lobbyists, organizational report scholarships-by-state appendix, October 26, 2012. ↑ 30.0 30.1 30.2 American Legislative Exchange Council, 2014 States and Nation Policy Summit Sponsors, organizational brochure, December 3, 2014. ↑ "CSINJ Healthcare Summit 12/20/11"
↑ American Bridge 21st Century Foundation, Funder: Jaquelin Hume Foundation, Bridge Project conservative transparency website, accessed November 2013. ↑ American Legislative Exchange Council, 35 Day Mailing— Agendas and Proposed Model Policies for 2013 States and Nation Policy Summit, organizational document, October 30, 2013. ↑ American Bridge 21st Century Foundation, Funder: The Vernon K. Krieble Foundation, Bridge Project conservative transparency website, accessed November 2013.